Some of the most rewarding and memorable moments you will have during your time in Vietnam will occur while visiting local ethnic markets. 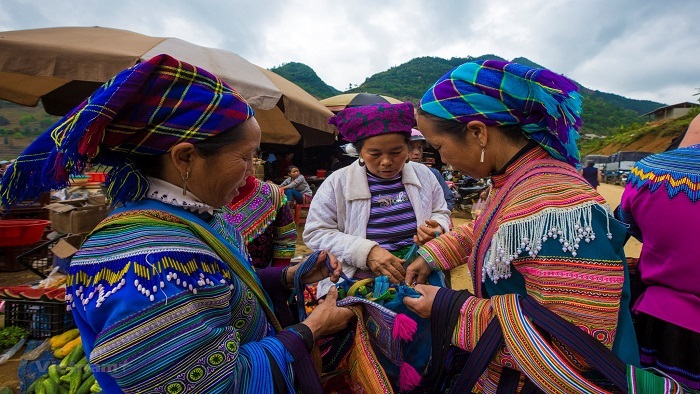 Markets differ greatly across Vietnam, from the water markets of the Mekong to the hustle and bustle of Hanoi's old quarter, but nowhere are they as diverse, nor as interesting, as they are in the mountains of Northwest Vietnam. 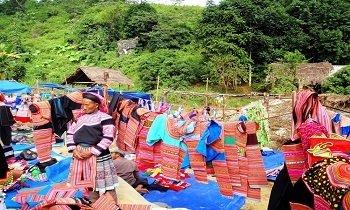 Here, we will explore one of the most colorful markets in Sapa - Can Cau. 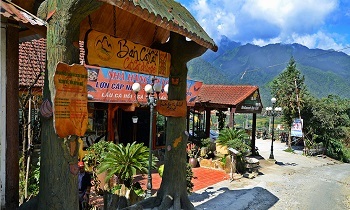 Can Cau market is located in Can Cau commune, Si Ma Cai district, Lao Cai province; nearly 100km to the northeast of Lao Cai city, about 30km north of Bac Ha town, Bac Ha district, Lao Cai province. 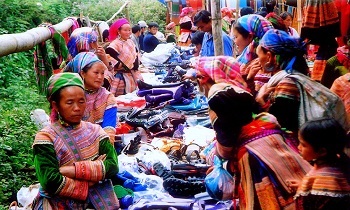 Can Cau market belonging to a commune, Lao Cai district. Visitors have not only the opportunities to be aware of fair but also a chance to learn more about the daily life of people. 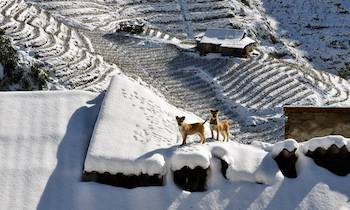 From Lao Cai province, along the national road 4D, visitors will come to Bao Thang district, Lao Cai province. 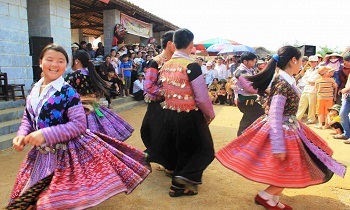 Through the town of Bac Ha, tourists will come to the Can Cau fair. 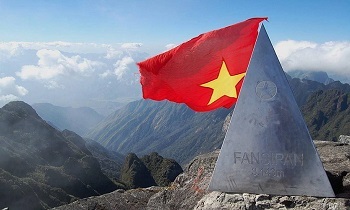 From a distance, the fair of Can Cau is very beautiful and vivid. The fair has meeting along roadside 153-the only road connects the town with the town of Si Ma Cai. 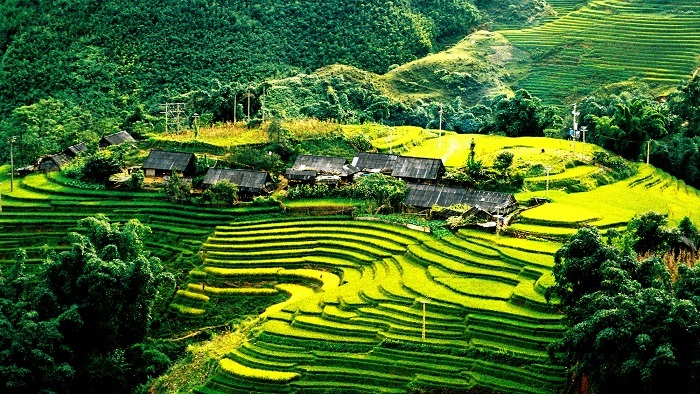 There have terraced fields around the market with the majestic mountains. The market is divided into separate areas for all kinds of items. 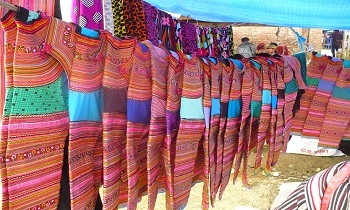 Those goods such as: vegetables, herbs, spices, utensils and other products, which shows the talent of women. However, the most striking is the area where sell livestock because the H’Mong and Giay love livestock and want to select the best cattle. The atmosphere in this area is very vibrant; buyers, sellers have the deal. The road to the heavenly gate is quite zigzag but still cannot stop the footsteps of visitors to visit the Heaven Gate. Few people know on the road leading to Ta Phin village, there is an attractive tourist destination in the middle of beautiful green grass hills, which is the ancient Ta Phin monastery. Ta Phin Ancient Monastery is one of the very famous works in Sapa. Although abandoned for more than half a century, the beauty of this place still has great attraction. 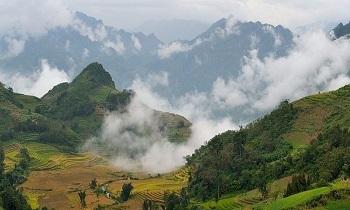 Many visitors to visit Ta Phin village will visit the ancient Ta Phin monastery in Sapa. Around the ancient monastery are tall peaches. If you come here in the spring, you will see the cherry blossom scene blooming around the ancient monastery, looking very beautiful. Although it has been abandoned for a long time, the ancient space of the monastery still makes many tourists stop to take photos. 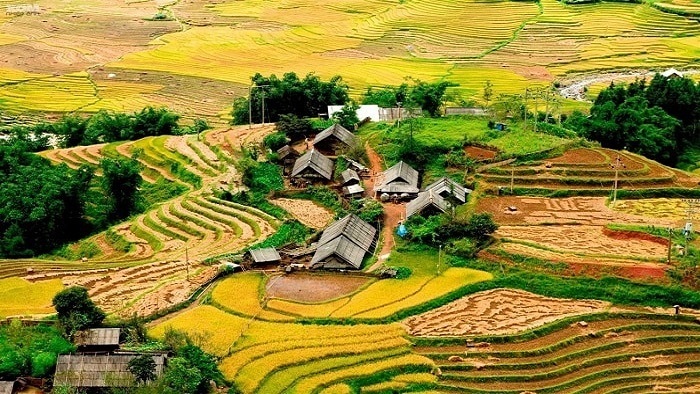 Muong Hoa valley has very nice terraced fields and an odd ancient stone field interspersed in rice fields and grass flowers. Hundreds of ancient stones sculpting these strange characters are classified as national monuments that need to be preserved. 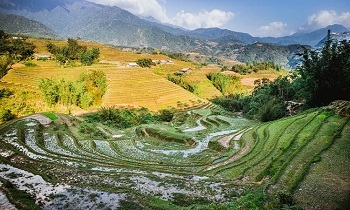 Not only are terraced fields and ancient rocks, there is also a stream flowing through the valley to the Ta Van village and ending at Ban Ho. The scene of beautiful terraced fields, strange ancient rocky beaches and beautiful Hoa stream creates a beautiful natural picture, a beautiful hybrid place in the Northwest mountains and hills. In addition, tourists joining Sapa Vietnam homestay have been enjoying some traditional dishes and “Tao Meo” wine- specialty of Sapa.